Simplify complex workflows and empower users to take decisive action by adding interactive buttons to your messages. 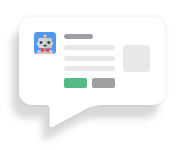 Make your notifications, slash commands, and bot users more intuitive with progressively evolving responses. All you need is a Slack app. Want to build rich interactions like this? Let's cover everything you need to know. Just want to make buttons linking to URLs? Use link buttons instead. For an overview of how interactive messages work, message buttons included, see interactive messages. Everything that follows builds on the interactive message framework. And, yes, buttons can be delightfully combined with message menus. You'll be building messages that contain attachments and attachment actions. You may want to review how basic message formatting and message attachments typically work. Interactive messages are made up of very simple building blocks that can be combined, modified, and removed based on your server's responses to create interactive experiences. Here's a message with buttons containing simple values for the most important fields you'll use when composing interactive messages. Your messages may get more complex than this, and we'll dive into a more complex example later. This message has some light text, three specific buttons, including one that looks like a destructive action. Try it in the message builder! the callback_id you set when creating the message. The callback_id is required. Without it, Slack can't show your app which message a user has interacted with. If curious about other formatting opportunities, check out our formatting guide and these details on attaching content to messages. 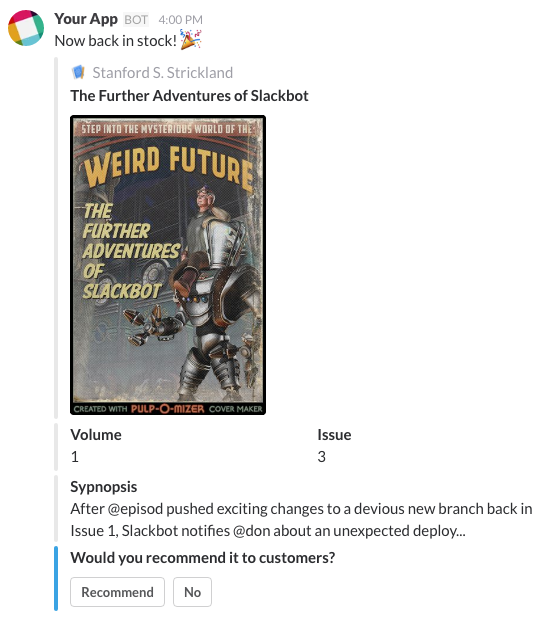 "text": "After @episod pushed exciting changes to a devious new branch back in Issue 1, Slackbot notifies @don about an unexpected deploy..."
Try it the message builder! The time has come for your application to respond to a message action. Your Action URL will receive a HTTP POST request, including a payload body parameter, itself containing an application/x-www-form-urlencoded JSON string. Once you receive this payload, it's up to your app to decide what to do next. It might trigger some incredible event like making sure someone gets paid or it might just mean it's time to ask further clarifying questions. Maybe the next message you attach won't have a button but a message menu instead. At this point, there's nothing special about message buttons that isn't also true of message menus and any interactive message. See responding to message actions to continue learning about the interactive message lifecycle.